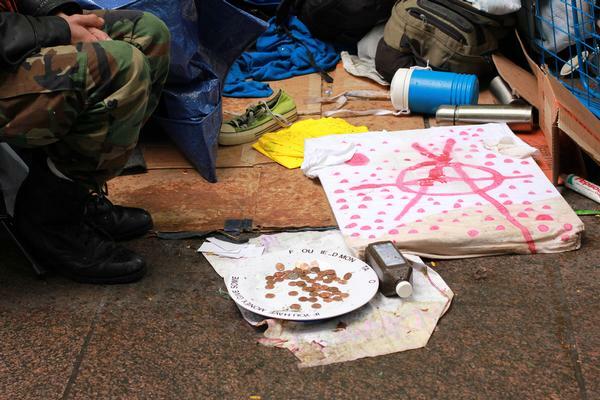 Occupy Wall Street Struggles with … Accounting? The charitable status of OWS&apos;s fiscal sponsor means that the Internal Revenue Service will want to verify that every donation is used for charitable purposes. Even a protest against banking and finance has a certified public accountant. That&apos;s one curious aspect of the Occupy Wall Street movement, which is trying to deal with the crush of donations from the month-old movement. According to Pete Dutro, 36, an NYU finance student and member of the Occupy Wall Street finance committee, over $100,000 has been raised since the occupation started on Sept. 17. But the movement is struggling with the overwhelming volume of donors that have overloaded the online donation system. “When [Occupy Wall Street] started discovering that people wanted to give them money, they contacted us, neither side dreaming that it would grow to what it has,” says Chuck Kaufman, a national co-coordinator with the Alliance for Global Justice (AFGJ). AFGJ, a Washington D.C-based charity, got involved in the movement through Occupy DC on Oct. 6, and subsequently became the fiscal sponsor for Occupy Wall Street, which allowed the movement to accept more than in-person cash donations. In exchange for accepting payments on behalf of organizations, AFGJ deducts an administrative fee of 7 percent. AFGJ is handling both online and telephone donations and has experienced serious problems in the past week, as both their office telephone and Internet service were mysteriously disconnected twice. Kaufman found the timing suspicious, but says he has no proof of wrongdoing. Then, on Oct. 7, their online payment processor, E-Onlinedata, stopped accepting donations and left $80,000 in existing donations inaccessible to the movement. “They were alarmed when we went from processing a couple dozen transactions a week to 400 a day, so they called and we explained what was going on. Despite that explanation, they froze the account,” Kaufman said. Kaufman then asked supporters to call E-Onlinedata and complain, which generated a torrent of phone calls to the company. After a testy phone conversation with the firm&apos;s president, Kaufman agreed to ask the protesters to stop calling the company in exchange for releasing funds. Another financial burden stems from AFGJ&apos;s 501(c)3 charitable status. Kaufman said the Internal Revenue Service wants to verify that every donation made to a charity is used for charitable purposes. He travelled to New York to meet with Occupy Wall Street&apos;s finance committee on Oct. 8, emphasizing that they need to keep a record of every expenditure, whether that&apos;s fuel for the generators that run the lights in Zuccotti Park, or food purchased for the communal kitchen. Volunteers like Dutro now need to comb through hundreds of receipts and turn the data over to volunteer accountant JoAnn Fleming. “There were a lot of receipts that were just in jumbled piles and sorting through all of that has taken a very long time,” Dutro said. Down at Zuccotti Park, protester J.J. Murphy, 58, of New York, said that while she&apos;s “sure that money is going right out to buy more food,” she acknowledges that movements she was involved in during the 1970s went off the rails for financial and other reasons. City Limits is grateful to the City University of New York&apos;s Graduate School of Journalism and Professor Lisa Armstrong, who oversaw this project. Election 2017: Who’s Who in the Race for Mayor? Everything you want to know about the 2017 race but were afraid to ask. The 2019 commission began winnowing its work down to the questions that it will put on the ballot in November. And the focus discernibly shifted from the sweeping to the particular. In the 2018 election and many before it, New Yorkers faced a voting hurdle unlike voters in most other major cities: a relatively low number of polling places, scattered unevenly through the city. A panel discussion that will bring together advocates, tenant leaders, policy experts, and community development professionals to discuss the impending Rental Assistance Demonstration conversions at NYCHA properties, implications for residents, and the potential role of community development organizations in protecting long term affordability. The city’s proposal aims to bring affordable housing, open-space resources, transit improvements, economic development and health assets to the ever-changing Brooklyn neighborhood. Waivers that exempt able-bodied adults in areas of higher unemployment from food-stamp work rules encourage dependency, conservatives say. But local experts contend the cost of withdrawing those waivers will exceed any benefit. Rising commercial rent is a major worry for immigrant businesses around the city, according to a survey released this week by the Association of Neighborhood and Housing Development.